Among the swiftest and most agile of Terrasaurs are the raptix, smaller but still lethal carnivores that are noteworthy for their powerful legs and leaping ability, allowing them to intercept low-flying aircraft. Brontox are herbivores and among the gentlest of Terrasaurs, bringing instead a stoic disregard and virtual immunity to small weapons fire, protected by thick hides and muscle mass. 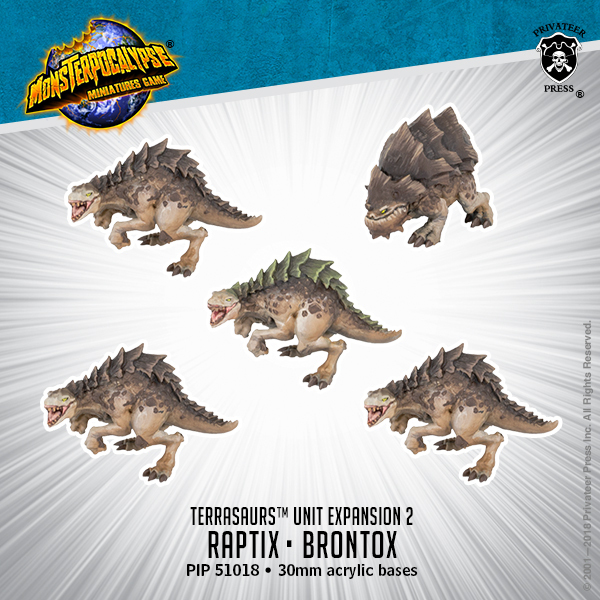 Brontox are sent forth to expand Terrasaur nesting grounds, protecting eggs until they can mature.